As the last visitor badge was issued late Wednesday afternoon, total registrations for MAST Asia 2017 hit 4,234 from 39 countries over three days. Japanese government agencies, self-defence forces, and industry were well represented, with 1,600 participants from JMSDF, JASDF, JGSDF, MOD, ATLA, METI, MOFA and several government ministers – and for the first time Japan’s top domestic defence contractors all had their own booths. The exhibition hall was double the size of the inaugural event, and with typically larger booths and country pavilions created a more open and productive environment than previously. 135 VIPs from 21 countries took part, many joining MAST’s hosted VIPs/buyers programme, and creating abundant opportunities to interface with prospective contractors. 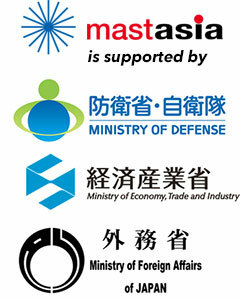 130 media representatives documented the event, this time focusing on the operational, technology, and geo-political issues presented by MAST Asia, rather than its unique status as Japan’s only international defence conference and exhibition. Three dedicated bilateral talk rooms were busy through the days with talks taking place at the highest level of international navies and government authorities. 95% of all exhibitors surveyed during the show by the MAST sales team said they will return to the next MAST Asia, which will be moving into Central Tokyo (Monday 17th to Wednesday 19th June 2019), and many of these have also confirmed to take part in next year’s MAST Indo-Asia 2018 event in New Delhi, India (Wednesday 28th to Friday 30th November).